You can now pay RTI Fees through eIPO i.e. online, without having to purchase a physical IPO from the post office. See below for more. What is an Indian Postal Order? An Indian Postal Order is a useful way of sending and receiving small amounts of money from / to any corner of India. The Indian Postal Order is especially useful in making payments for an application under the Right to Information Act, to make a payment to the Authority you are seeking information from. An Indian Postal Order can be used only for making RTI payment to a Central Government Department. For State Government Departments, see their RTI Rules. Eg: In Maharashtra, Court Fee Stamps are accepted. This article will help you understand how to purchase, fill and submit the Postal Order, along with your RTI Application. Where is the Indian Postal Order available for purchase? The IPO can be purchased from any Head or Sub-Post Office in India or any post office specially authorized for this purpose. This includes Army Post Offices. What are the denominations available for purchase? The IPO is available in 6 denominations. You need to pay a commission amount on the IPO’s purchased by you. RTI Applicants must check the fee amount they need to pay. It is usually Rs. 10/- per application, but you must verify the latest applicable fees. Also fill in the same details on the counterfoil. Tear the counterfoil and keep it, before you submit the IPO with the application. For RTI Applications, if you are unaware of what details to write, leave the IPO Blank, but mention the IPO Number within your application letter. It would also be useful to take a photocopy of the IPO, before sending. For how long is the IPO valid? The IPO is valid for a period of 6 months. The 6 month period is calculated from the last date of the month in which it was issued. Eg: If the IPO was issued on 5-Jan-2011, then it will be valid for 6 months from 31-Jan-2011. The IPO can be renewed beyond this period of 6 months, for an additional 6 months, by paying the commission amount due on it. How can I encash the postal order? The IPO must be within the duration specified above, it must contain the payees name and the Post Office name. To encash the valid postal order, it must be presented at the counter of the Post Office mentioned, by the payee himself. Can I cancel the IPO? Yes. You can return the IPO to the same Post Office from where it was issued. You will get a refund of the entire amount of the IPO, not the commission amount. This entry was posted in Useful Information on December 18, 2017 by admin. At various times in our life, we need to hunt for Gazetted Officers, to attest our mark sheets and academic or financial documents. This article gives you a brief idea of whom you can approach for the attestation. Who is a gazetted officer? What authority does the gazetted officer have? Refer to this page to identify a gazetted police officer by his shoulder insignia. This article deals with successfully complaining about potholes, melting roads, broken footpaths and all other problems related to the road conditions in Mumbai City. 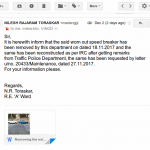 Which governmental authorities are responsible for maintenance of roads in Mumbai? Road maintenance is the primary responsibility of the Municipal Corporation of Greater Mumbai (MCGM). However, there are other authorities who also are responsible for maintenance of roads (carriage-ways). 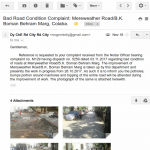 How does a citizen complain about bad roads in Mumbai? 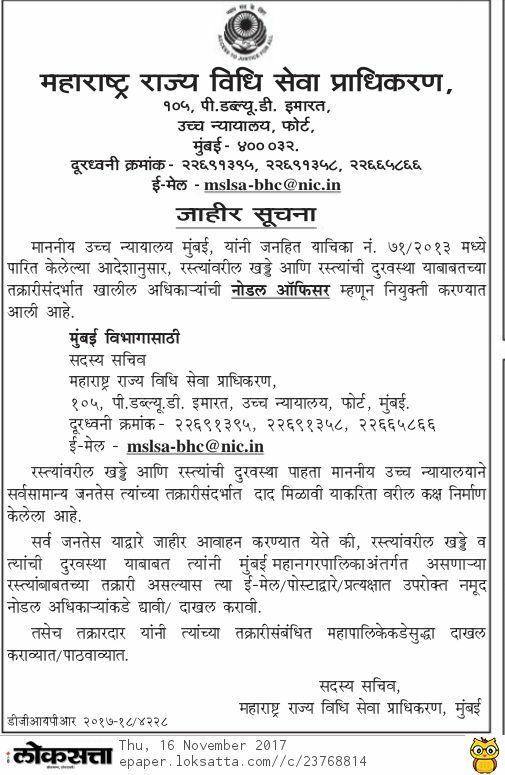 105, High Court, (PWD Building), Fort, Mumbai 400032. Is there a format for making complaints? No there is no format for complaints. This road has been in this condition since over 2 years now. It appears to be worse than the surface of the moon. 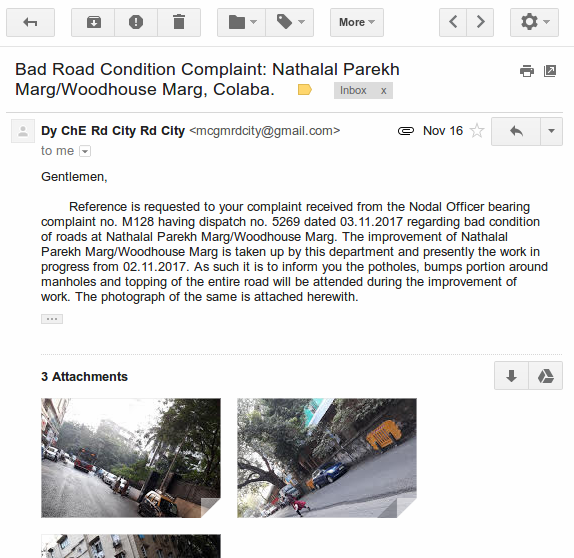 Do acknowledge this complaint and kindly provide me a complaint number for follow up. 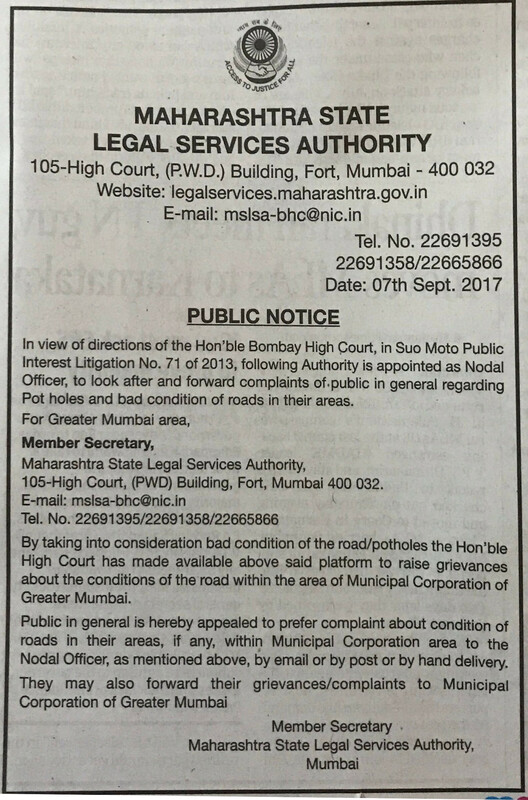 What type of complaints can be made regarding bad roads? How effective is this mechanism for complaining about bad roads? As of December 2017, this mechanism for road complaints is extremely effective as the whole complaint process is monitored by the Maharashtra State Legal Services Authority. Hence all responses have to be given in a time bound and systematic manner. A few email responses to complaints are given here. What is Suo Motu PIL No. 71 of 2013 of the Bombay High Court? Suo Motu PIL No. 71 of 2013 was a Public Interest Litigation which the High Court instituted on its own, without any particular citizen or aggrieved party coming forward to complain about the bad road conditions specifically. This article is being constantly updated. 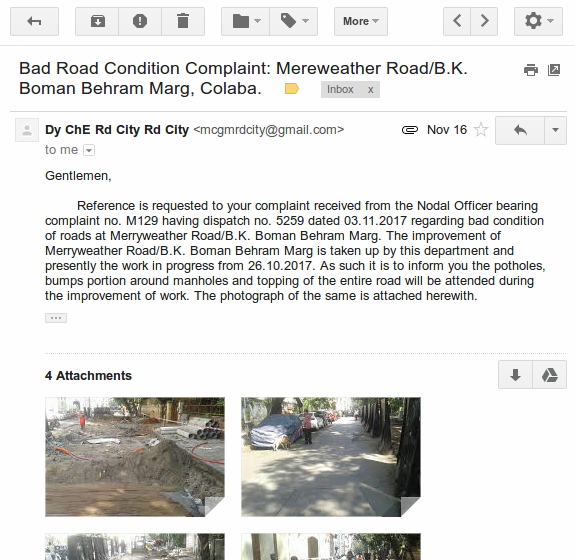 This entry was posted in Useful Information and tagged complaint, mumbai, road on December 4, 2017 by admin. This article explains what the Index – II or Index 2 document means when Registering a Document or referring to a document which has been registered. Why is Index II named so? The Index No. II is named so because the Registration Act 1908 requires the preparation and maintenance of a number of Indexes for the purpose of record keeping in the Registrars office. Are there more Indexes besides Index No. II? What do the other Indexes contains? Yes. There are 4 Indexes to be made and kept at the registration offices. (1) Four such indexes shall be made in all registration offices, and shall be named, respectively, Index No. I, Index No. II, Index No. III and Index No. IV. (2) Index No. I shall contain the names and additions of all persons executing and of all persons claiming under every document entered or memorandum filed in Book No. 1. Is the Index II a public document? Yes. Like any registered document, the Index – II is also a public document and a certified copy is available to any member of the public upon payment of fees and making an application. How can we get the Index II of a registered document in Maharashtra? What information does the Index II document contain? 8. Names of Persons of the Other Part executing the document or presenting the document or Details of Court order etc. (This would be the Buyer or License or Tenant etc. What can the Index II be used for? Where is the Index 2 used? The Index II and its certified copies serve as Evidence of Registration of the Document. Without disclosing any clauses or conditions in the document, the Index 2 summarizes the transaction and details of property mentioned in the Registered Document. The Index 2 is used as proof to show transfer deed execution or to confirm the legitimacy of the execution of a registered document. It is used at the time of Mortgage / Loan / Sale / Transfer etc. to show the completion of the Transfer of Immovable Property as per the Transfer of Property Act. The Registration of a Document or the Index II does not show the validity of the contents of the document or the legitimacy of the truth of the facts stated in it. It is merely a proof that such a document was presented for registration and was registered. Is it safe to give my property agent or Society office a copy of the Index II document? Yes it is quite safe to give a copy of the Index II document as it is a public document and can be obtained by any person. This entry was posted in Useful Information on November 9, 2017 by admin. This article helps the common man use the MahaRERA system to find information about real estate construction projects in Maharashtra. What is the meaning of MahaRERA? From when does MahaRERA come into effect? What are the common issues which the MahaRERA law deals with? Which are the RERA and related laws in Maharashtra? Where is the MahaRERA Headquarters? What information is available to the Public using the MahaRERA website? 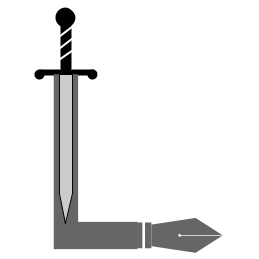 Information Type = Project Type i.e. Residential / Commercial etc. Are there any Co-Promoters (as defined by MahaRERA Order) in the project ? Plot Bearing No / CTS no / Survey Number/Final Plot no. This entry was posted in Useful Information on November 5, 2017 by admin.